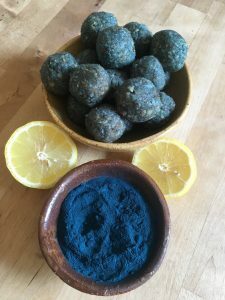 Blue Majik and Lemon Energy Balls | Ridge's Stitches | Health Coach. Yoga. Clothing. I love the Blue Majik from E3 Live. It’s so sparkly and just the coolest. You can read up on my struggles to obtain this magical blue spirulina here. I wanted to create some blue balls the other day. Some blue balls that would give you all the gain without any pain. Blue Majik is great for decreasing inflammation after exercise, supports healthy joints and flexibility and increases energy and endurance. Plus they’re so easy to just pop one in right before you head out the door. Let me know what you think! Add adaptogens to the mix to keep your stress levels balanced. Soak dates in hot water for 10 minutes. Remove pits if necessary. Combine cashews and dates into a food processor and pulse until broken down into small pieces. Add coconut flakes, hemp seeds, lemon juice, coconut milk, Blue Majik, and Spirit Dust Moon Juice adaptogens and combined until smooth. You will need to use a spatula to scrape down the sides of the bowl a few times. The mixture should form a ball. Refrigerate for about an hour then roll into bite sized balls!